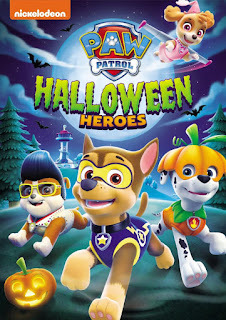 With Halloween here we wanted to bring you guys this awesome chance from Nickelodeon to win their wonderful new title Halloween: Heroes featuring all your favorite Paw Patrol friends. This is the perfect DVD to get the kiddos in the Halloween spirit! Get your copy as soon as it is released! The PAW Patrol is back for spooktacular adventures in the brand new DVD collection, PAW Patrol: Halloween Heroes. Available September 11, fans can get into the Halloween spirit with the pups as they bravely board a ghostly pirate ship, explore cabins, caves and mazes, try to solve the haunting of the Lookout Tower and more. Fans will have a scary good time watching all seven PAW Patrol adventures including a really ghoul double-length special! PAW Patrol: Halloween Heroes is produced by Nickelodeon Home Entertainment and distributed by Paramount Home Media Distribution and will be available for the suggested retail price of $10.99.